The L-CAT® Shore-to-shore presented by CNIM at Euronaval 2018 delivers a major increase in performance for amphibious missions. The L-CAT® Shore-to-shore has been upgrated since its launch 2 years ago. The L-CAT® Shore-to-shore is now the only vessel with the ability to transport 80 tonnes at 25 knots in conditions up to sea state 5, land in shallow water (~1m) and accommodate 42 passengers for long distance trips. Highly maneuvrable, the L-CAT® Shore-to-shore provides exceptional operational flexibility for amphibious assaults and humanitarian operations, without compromising between speed and payload. Its wide loading platform (145 m²), ability to travel up to 800 nautical miles when loaded, self-defence and communication capabilities are tactical advantages for the projection of Forces. Its speed of 35 knots unloaded allows for the theatre of operations to be cleared rapidly via fast rotations. As with all CNIM amphibious crafts, the L-CAT® Shore-to-shore is able to deploy semi-rigid boats and underwater robots for beach reconnaissance. Active in the Naval Defence sector since 1856, CNIM is a trusted partner in France and throughout the world for the design and construction of amphibious landing vessels and naval equipment meeting the high-level operational requirements of Naval Forces, the maritime sector, systems manufacturers and shipyards. CNIM offers a unique set of skills, combining expertise in the field of maritime operations with technical and industrial excellence across all projects. Working for the Strategic Oceanic Force (French Naval Deterrent Force) since 1961 and long-time supplier to the French Navy, CNIM designs and manufactures solutions meeting specifications with the strictest standards for quality and performance. 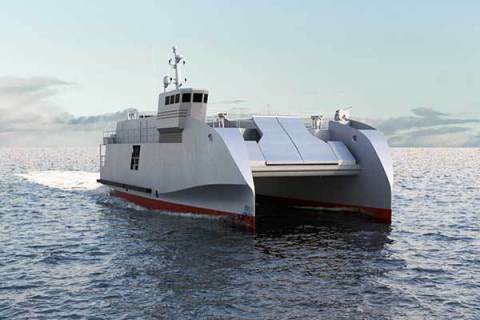 CNIM naval solutions are built around two areas: amphibious crafts either operated from a mothership or not, and naval equipment for key missions on board surface vessels and submarines.